"Caitanya Mahaprabhu explains that Krsna is just like the sun, and maya, the illusory energy, is just like darkness. One who is constantly in the sunshine of Krsna cannot possibly be deluded by the darkness of material energy. This is very clearly explained in the four principle verses of Srimad-Bhagavatam and is also confirmed in the Srimad-Bhagavatam (Bhag. 2.5.13), wherein it is stated: 'The illusory energy, or maya, is ashamed to stand before the Lord.' Nonetheless, the living entities are constantly being bewildered by this very illusory energy. In his conditioned state, the living entity discovers many forms of word jugglery in order to get apparent liberation from the clutches of maya, but if he sincerely surrenders unto Krsna by simply saying once, 'My dear Lord Krsna, from this day I am Yours,' he at once gets out of the clutches of material energy. This is also confirmed in the Ramayana, Lanka-kanda (18.33), wherein the Lord says: 'It is My promise and duty to give all protection to one who surrenders unto Me without reservation.'" 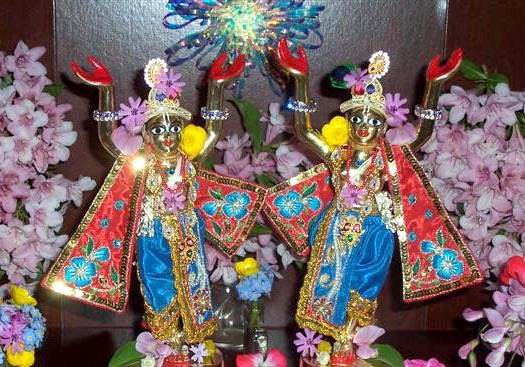 * Special thanks to Cintamani Devi Dasi of North Carolina for her blissful photos of the Deity form of the Lord.